A few weeks ago I was asked to do some generic implementation of ReactJS renderings in Sitecore SXA. The challenges: It needs to work with standard SXA, using dynamic placeholders, using an ORM mapper like Glass but also pass only needed data structures to the components, thus the serialization may not be too bloated. During this journey I found an interesting issue you might get into as well. As you may have read in one of my posts Tuning Sitecore Experience Accelerator (SXA) with React.Net it is quite easy to have your own components included in SXA having placeholders where you can add additional components. And you want them to be dynamic. That means that under the hood a Guid is added to the name of the placeholder. This way when you re-use the component they do not have the same child components in them. To make it all very easy for you to understand I leave out all code stuff and focus just on the actual problem. The code is simple and handles the creation of dynamic placeholders based on the datasource template of my component. Now that we have all the things in place we can add the component to the page. In the available Renderings section of the SXA Presentation node I've added my component so I can drag it onto my page in the Experience Editor. 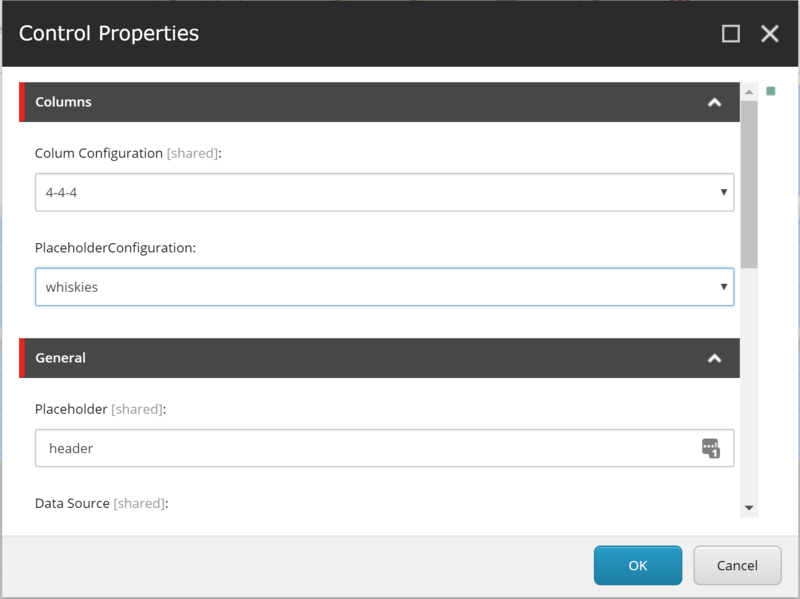 I select the Component Properties and select the Placeholder Configuration pointing to the keys I need to use. It is a necessity to have placeholder settings in place otherwise they won't show up. For the ease I will not fill the Allowed Controls. So what if I would remove the dash sign from my placeholder? All placeholders are showing. You can even use underscore signs, slashes and other signs in your placeholder key names. Using dashes followed by a number just will disable your component. Next step is to do something different, the right way: use Sitecore SXA. It works when just having a number and not any trailing words. Also notice the nice guid now in the name. That wasn't here before! The placeholder implementation of SXA is very different. As stated here: When you use dynamic placeholders, you can add the same placeholder name several times. You can do this across multiple renderings, and you can even use the same placeholder multiple times in a single rendering (source: Sitecore). So avoid dashes with numbers and letters in them, even dashes of water in your whisky! cheers!